This giveaway ends on 31 July. I'll take pics of all the names participating and of the winner's name, yay! 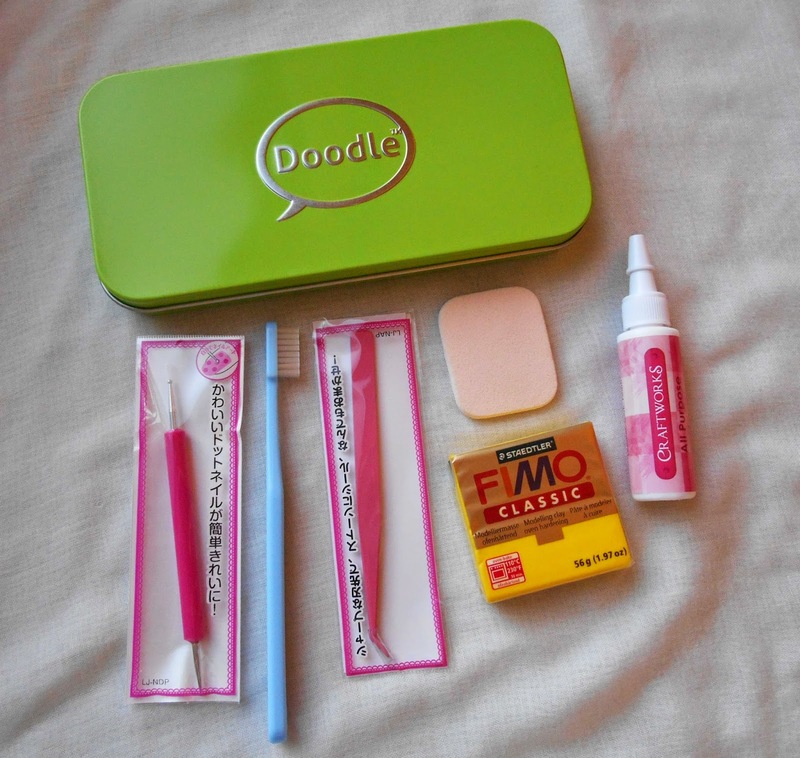 Green pencil case (tin), dotting tool, toothbrush, tweezers. soft sponge, all purpose tacky glue and fimo classic clay in yellow. 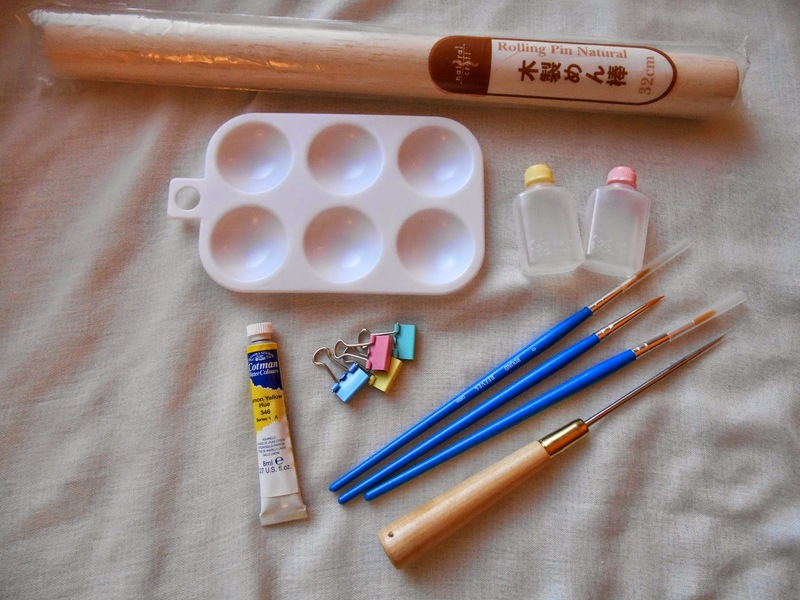 Wooden rolling pin, plastic palette, Winsor & Newton yellow watercolor (perfect to color fimo air dry light), 4 tiny binder clips, 3 Reeves brushes (0, 1 and 3), a great needle tool (i've the same one and it's awesome to work with!) and 2 small plastic bottles. ***Hugs*** and lots of good luck!! Termina el 31 de julio. Voy a tomar fotos de los nombres que participan y del ganador! El premio consiste en: caja de lata verde (para guardar la mayor parte de las cosas), esponja, pinzas, herramienta de bolilla de 2 tamanos (dotting tool), cepillo dental, pegamento multiuso, un bloque de fimo classic amarillo, palo de madera, 2 contenedores chicos, 3 pinceles Reeves, paleta plastica, acuarela Winsor & Newton (ideal para colorear fimo light de secado al aire), 4 ganchitos y una maravillosa herramienta de punta para trabajar fimo o cualquier pasta de modelado (yo tengo la misma). Hi Ann! I tried to leave a comment before but not sure if it went thru. What a great idea for a giveaway. Hope you can include me. Thanks! WoW, what a great Giveaway! I am always trying to find the perfect type of tool to make mini foods with and you have included so much as a package. Please count me in the draw for this super Giveaway! How nice of you to have a giveaway of such useful tools. I would love to participate. I follow you on G+ & Pinterest. I will put a link on my blog too. I'll put it Anonymous here because I use my brother's gmail//I hope its okay! I would also love to participate! 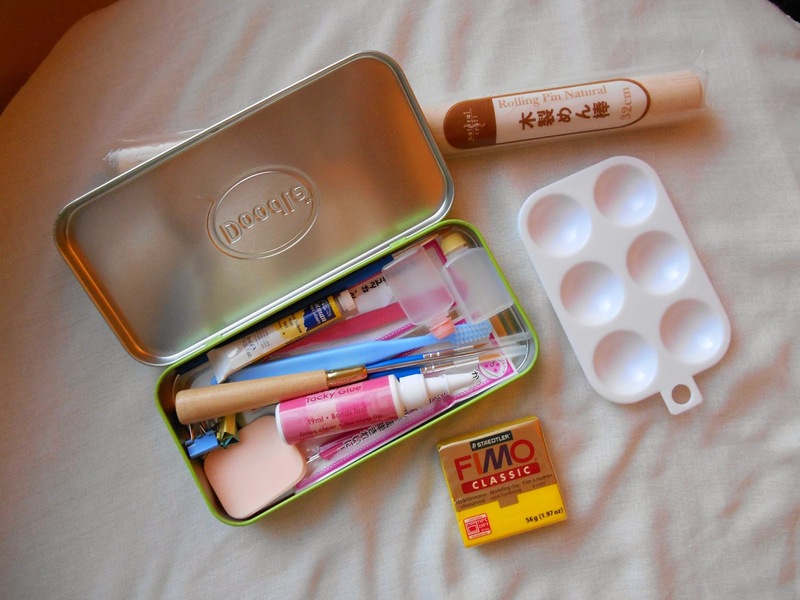 Hi Ann, Nice useful tools and I love the green tin! Thank you. I have been following for awhile. HI, I love your blog and the giveaway prize looks like something I could really use. Thank you for a great giveaway!!! will be on my blog. I also have my own giveaway scheduled for 31 July. It's a book. You are invited to see if you like to participate. I'd love the chance to enter your great giveaway. Me gustaria participar en tu sorteo! ya tienes una seguidora mas, me he vuelto loca buscando tu gadchet de seguidores, luego he visto que tus seguidores van de otra manera, creo que lo he hecho bien. Me gustan mucho las miniaturas que haces. Te comparto en mi blog. Besos! y gracias por participar! Follow you via Bloglovin + Pinterest. I'd LOVE to enter in your fab draw - hope you'll count me in. I've visited your blog and it's gorgeous! ... so birthday? well, I'm going to send you a little present then :) ...see? your luck is changing already! Followed you on bloglovn and as a member. Also google+ You cute so real looking miniatures inspire me so much. If you want to play on this post please click here thanks.